Take a trip to Patagonia and find a legendary land of extremes spanning the southern regions of Chile and Argentina to the tip of the continent: Ushuaia, gateway to Antarctica. A tour of the towering granite spires of Torres del Paine, Fitz Roy, and El Chalten has some of the world's premier hiking and trekking destinations. The El Calafate region and Perito Moreno Glacier offer a close encounter with some of the world's most astonishing glaciers. 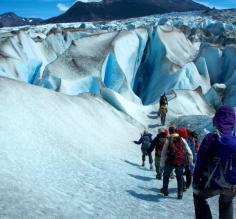 Visit them all on a tour like Patagonia Hiking Express. Cruises admiring breathtaking fjords and glaciers and sailing to the legendary Cape Horn are also favorites among discerning travelers. 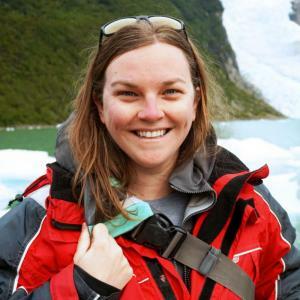 Adventure Life's Patagonia travel experts will help craft your perfect cruise, trek or tour of Patagonia and the southernmost regions of the globe. Start planning your trip here. On this tour of Chile's Southern Patagonia region experience penguins, guanacos, Darwin's Rheas, Andean foxes, and more as you hike or even bike Torres del Paine. Optional excursion available to explore the Straits of Magellan to Magdalena Island, where you can see over 100,000 Magellanic penguins! Enjoy the best of Patagonia trekking during this holiday season, departing January 1 for an 8-day hiking and camping experience along the Paso Los Cuernos trail and exploring Torres del Paine National Park in an unforgettable adventure! This Argentine Patagonia hiking trip takes you among glaciers and steep granite spires in the famous Fitz Roy Range. Next it's off to Los Glaciares National Park for a hiking trip to the thundering Perito Moreno Glacier and a night at a historic estancia before culminating your tour in Buenos Aires. Enjoy an adventurous holiday departing December 23 or 27 for this 9-day Patagonia Express tour exploring Argentina's Los Glaciares National Park, Perito Moreno Glacier, and Chile's Torres del Paine. Explore Torres del Paine in this multisport tour of Patagonia's best while hiking, biking, kayaking, horseback riding, and trekking! With EcoCamp as your home base, explore magnificent Patagonian mountains, glaciers lakes and rivers spotting guanacos and ostrich-like rheas. Visit Ushuaia, Los Glaciares National Park, Tierra del Fuego National Park, El Calafate and the breathtaking Perito Moreno Glacier for the holidays on this relaxed 8-day trip to Argentine Patagonia, with departures on December 24 and 27. Begin your holiday Argentina hiking expedition by flying to Patagonia's El Calafate and then driving El Chalten, where you'll hike among glaciers and towering granite spires in the world-famous Fitz Roy Range, taking to the backcountry on a 4-day trek. Sail for remote and beautiful corners of the world on this 5-day itinerary on the MV Stella Australis through southern Patagonia. Begin in Punta Arenas and make your way to Ushuaia, stopping to view glaciers, marvel at impressive ice fields, explore historical sites, and visit the unique wildlife of the region. A complete hiking and trekking adventure that combines the best of both Argentine and Chilean Patagonia travel! This two-week journey pairs our Argentina Glacier Adventure itinerary with the Pure Patagonia trip, for those hearty hikers in search of southern South America's breathtaking backcountry scenery. This 13-day tour of Chile takes you from Northern Chile's Atacama Desert, to Santiago, the Lake District, then Torres del Paine. Along the way, enjoying hiking, biking, wine tasting, rafting, and other activities as you experience both the metropolitan and natural sides of Chile. Adventure Life's Patagonia travel experts reveal their favorite trips to Chile. Torres del Paine, Chile - Patagonia's most photographed panoramas are a legendary, world-class trekking and nature-lovers' destination. Surrounded by towering granite cliffs, blue glaciers, crystal clear lakes, raging rivers and abundant wildlife, a trip to Torres del Paine will yield a lifetime of memories. El Calafate, Argentina - See a glacier crumbling and crashing into the water below at Perito Moreno glacier. This and multitudes of glaciers in Glacier National Park afford breathtaking vistas and opportunities for adventure. 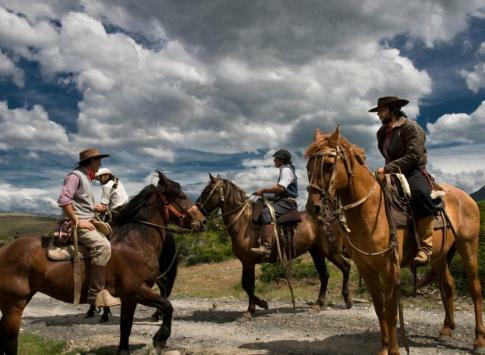 Your evenings are spent in luxurious lodges and historic estancias in Calafate and the surrounding countryside. Chalten, Argentina - Trekkers and climbers rejoice in the massive granite spires of the towering Fitz Roy Range and expansive ice-scapes of Glacier National Park. Ushuaia, Argentina - At the “End of the world” and hailed as the world's southernmost city, you’ll find the charming port city of Ushuaia where most cruises to Antarctica depart. Experience Fjords, glaciers falling into the sea and remote wildlife on a cruise between Punta Arenas and Ushuaia. These descriptions of Patagonia, one of the most remote and strikingly beautiful destinations in the world, will definitely leave any traveler with a sense of wanderlust. Travelers have endless opportunities for active adventures, wildlife encounters, and taking in spectacular scenery! 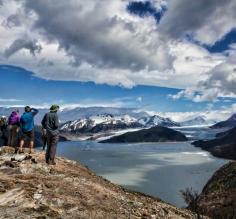 The vastness of Patagonia leaves travelers with a variety of possible experiences from which to choose! Take a look at the distinct regions and their highlights before your travels. Learn more about the history, characteristics, attractions, and activities this incredible region of Chile and Argentina has to offer. Planning an adventure in Patagonia is sure to result in questions! Our FAQ answers some of the most commonly asked things by our travelers. From packing suggestions to what currency to bring, this guide will give you some vital details before your travels. Hopefully, this will help better prepare you for your Patagonia trip. 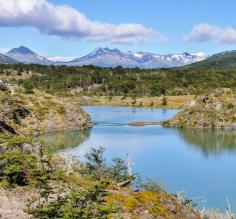 Exploring Tierra del Fuego is an adventurous addition to any Patagonia itinerary. It is an island separated from Argentina's mainland by a strait that joins the Atlantic and Pacific Oceans. Learn about the geography of the region, sites to visit, and activities that should not be missed. Travel to the "End of the World" on a trip to Tierra del Fuego, a truly unique place located in Argentina. Home to interesting people groups throughout its history, this destination has been shaped by past influences and events. 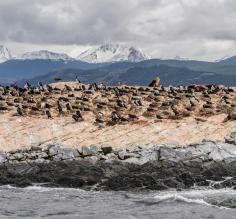 Experience what Tierra del Fuego has become during your Argentina trip. Discover the three main bioregions that make up Patagonia: the southern coast, mountain grasslands, and beech forests. These individual areas have a unique landscape and wildlife inhabitants that are characteristic of each. Learn more about the diversity that can be experienced in Patagonia. Among the 356 glaciers within the Parque Nacional de Los Glaciares, the Perito Moreno is the most outstanding. Travelers have the opportunity to sail around this massive icescape or even trek on the glacier itself! However you experience it, Perito Moreno is sure to be an awe-inspiring part of your Argentina trip. To say Patagonia is remote is an understatement. Encompassing the southern regions of both Argentina and Chile, Patagonia is accessed via flights from Buenos Aires, and Santiago respectively. There are now direct flights from North America or Europe. Direct flights between Patagonian Chile and Argentina are rare, so transport between countries is generally done overland. El Calafate, Argentina - a 3.25 hour flight from Buenos Aires is the access point for Perrito Moreno Glacier, El Chalten & Glacier National Park. With no flights to Punta Arenas, a 5 hour bus ride to Puerto Natales, then 3 hours to Punta Arenas. El Calafate's airport is Comandante Armando Tola International Airport (FTE). Punta Arenas, Chile - located on the Strait of Magellan, is a 3.25 hour flight from Santiago. 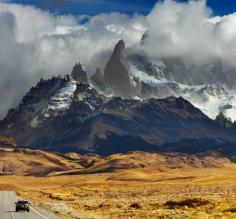 Buses/cars to Puerto Natales (2 hours) is the access point for Torres del Paine. Airport Presidente Carlos Ibáñez del Campo International Airport (PUQ). Torres del Paine is perhaps the most famous and popular destination in Chile's Patagonia region. And it's a veritable paradise for the adventure-seeking travelers! There are a number of activities that you can do here, including hiking, climbing, glacier trekking, and checking out the electric blue icebergs. 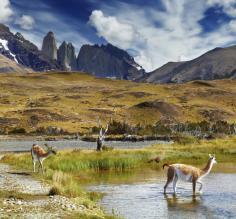 Among the hardy wildlife you will spot here are guanacos (which resemble smaller llamas) and even the stealthy pumas. Other wildlife struggles to survive in this habitat. In the windswept environment of Patagonia, camping takes on a luxurious tone at EcoCamp. As the name suggests, the primary focus of this innovative camp in the middle of Patagonia is to be at one with the serene Torres del Paine, which is why they have designed decadent igloo style huts inspired by the Kawesqar indigenous nomadic groups that once roamed this region. Spacious cabins put you right in the heart of the National Park, giving you easy access to activities like hiking, glacier trekking, penguin spotting, horseback riding, kayaking, and even yoga hosted at the main lodge. The name "Tierra del Fuego" translates to "Land of Fire," and harkens back to when explorer Ferdinand Magellan sailed these waters off the coast of Argentina some 500 years ago and saw many small campfires dotting the coast. Now, it is the province in the southernmost part of Argentina and the departure point for most Antarctica cruises, which leave from the port of Ushuaia. On your trip to this part of Patagonia, you will see plenty of sea birds and also have a lot of opportunities to participate in adventurous activities, like trekking across glaciers, kayaking, and hiking. The 11-day hike "At the End of the World"